We publicly provide source code and data for some of our projects. Below is an overview with links to all ressources and downloads. ShapeOp is a header-only C++ library for static and dynamic geometry processing, using a unified framework for optimization under constraints. Examples of its applications include architectural design subject to geometric constraints, and physics simulation of elastic materials. 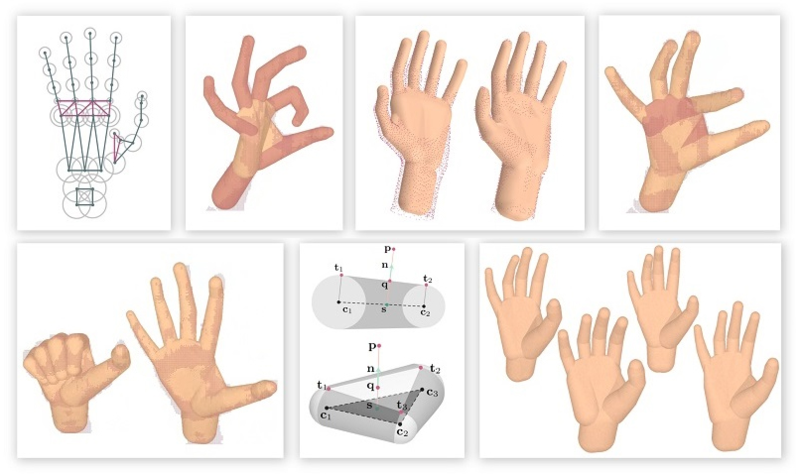 C++ code for online hand modeling and tracking from RGBD input. C++ code for high-accuracy hand tracking with sphere-meshes model from RGBD input. C++ code for hand tracking from RGBD input. Codes for computing Local Barycentric Coordinates. Our Satue Model Repository collects all the 3d datasets from the statues that were scanned by students during the Digital 3D Geometry Processing courses. A header-only C++ library for rigid registration of point clouds. Matlab code for our course on the basics of 2D/3D registration (presented at SIGGRAPH'13 and EG'14). The course covers the design of computer vision/graphic registration systems based on RGBD data. Source code for the Polygon Mesh Processing course textbook. Visualize and study the medial axis and related computational geometry structures in the plane. Scalable particle fluid simulation code for computational researchers interested in Lagrangian particle-based fluid simulation.